Over the past FLL season, we were excited to continue and expand our mentor program from last year. 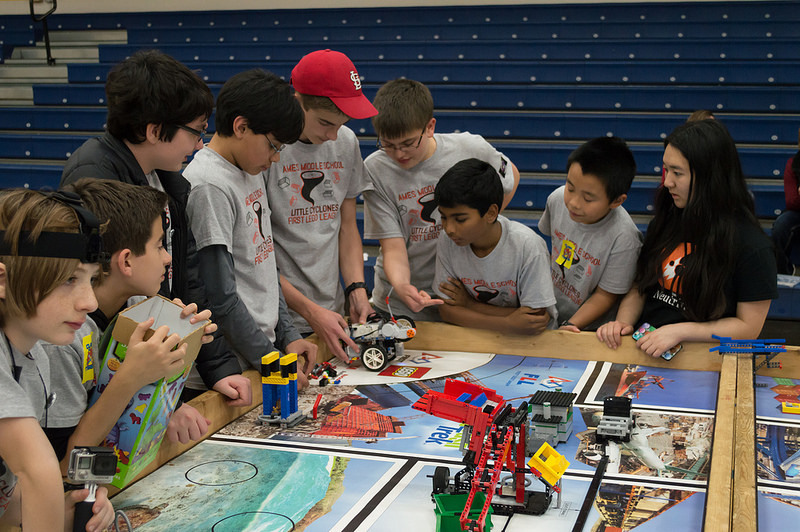 Twelve Neutrinos mentored eight Story County Area FLL teams. In this volunteering opportunity, we worked hard to give the teams guidance and advice about programming, robot design, the project, presentation, and core values. The teams were prepared for their competition this year, and two teams won awards that qualified them for the Iowa State Championships. With this program, we were able to work with them more often and more in depth. Over 70 students in FLL were impacted, and we volunteered for a total of over 130 hours. In addition to mentoring teams, we also organized a scrimmage at the Ames Middle School in order to prepare the teams for competition and present their work to their family and peers. 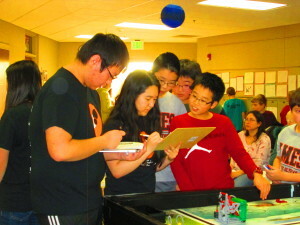 We also sent 14 volunteers to the team’s regional competitions at the Marshalltown Regional and the SCI Regional. With the conclusion of FLL, our team is looking forward to mentor the FLL Jr teams into the Spring. This entry was posted in Outreach 2015, Recycle Rush by Benjamin. Bookmark the permalink.